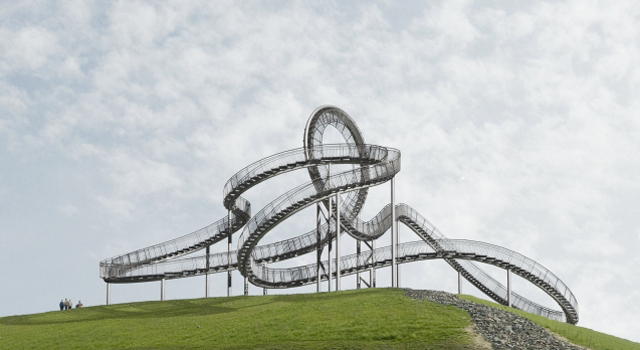 I love roller-coasters, and now you can walk on them. The landmark "Tiger and Turtle" is an art project in the South of Duisburg in the Ruhr area, part of the transformation process: from a heavy industry area (steel and coal) to a landscape park. "Tiger & Turtle - Magic Mountain" is the name of a huge sculpture by Heike Mutter and Ulrich Genth being built in the south of Duisburg as a stunning new landmark for the Ruhr region. Resembling the shape of a rollercoaster, the sculpture will be located on Heinrich-Hildebrand-Höhe in the Angerpark, which opened in 2008.